The other day, I was making Kanten Jelly with flaked Kanten for my next cooking class, coming end of this month. (whoo whoo) I found these flakes at Whole Foods Market. I have never used the flaked type before, so I just wanted to try it out. It took a little longer than I expected to melt all those flakes into the hot water, so it is difficult to put on my recipe because it's going to vary for the amount of evaporated water until all flakes melt. And also you don't want to keep boiling Kanten liquid for a long time. (This makes the Kanten jelly a more unclear color) In order to make easier and clear recipe, I am going to decide to use powdered Kanten. I added brown sugar to taste, and put strawberries in it. I put plastic wrap inside of small bowl and pour the Kanten liquid and twisted the top of plastic and tied. One of the great things about using Kanten is it's fast and the time it takes to turn to gel and be able to mold within 40-45min. You can use any kind of fresh fruits, (some can't be used in gelatin jelly because of the enzyme they contain) and they are almost non calories, (because it's seaweed) but it's great source of fiber! 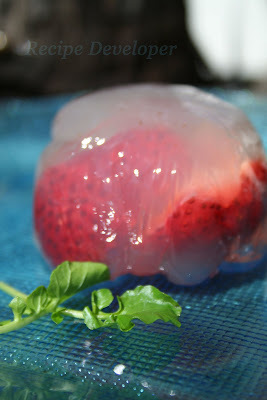 But the texture is totally different from gelatin jelly. I love the texture, but people who never had this texture might not like it at all. So, I need to try making Kanten jelly's texture little closer to gelatin more westernized. At the same time, I need to test again and make more clear.